On the banks of the Darling, near Menindee, two grown men are fighting back tears. It’s a week on from the fish kill that saw hundreds of thousands of fish die near their small town, including Murray cod that were estimated to be about 70 years old. These fish had survived the millennium drought of the late 1990s. Yet here they are dying. Each morning Graeme McCrabb and his mates patrol the river banks, looking for signs that another catastrophic event is about to occur – an event they argue is man-made. Last week Guardian Australia visited Menindee where we spent hours by a large waterhole which is all that remains at this point of the sometimes mighty Darling, Australia’s longest river. Temperatures are forecast to be over 40C again this week and there is sense of foreboding as the river levels continue to dwindle, the water an ugly shade of bright green due to algal blooms. “I am gutted,” says McCrabb as we watch a large cod floating in the middle of the river, dead. “That one’s in trouble too,” he says pointing to a large fish which turns on its side, flashing its white belly, tail languidly flicking in an effort to right itself. Four enormous cod, each about 80cm in length, rest near a shallow sandbank at the lip of the pool, trying to catch the more oxygenated water from the almost imperceptible flow into it. They hardly move. This is extremely unusual behaviour for these native fish, which are classified as a vulnerable species. People can go their whole lives without seeing these shy mottled green giants that hide in waterholes, and under logs, but here they are literally gasping for oxygen. “This is the biggest environmental catastrophe in the history of the river, and no one is here. It beggars belief,” says McCrabb of the lack of visits by any one from the federal government or the Murray Darling Basin Authority (MDBA) . The NSW minister responsible for fisheries, Niall Blair, did visit but toured the river by boat and did not meet locals, citing safety concerns. McCrabb’s friend Paul Grose is close to tears. “I am passionate about the cod. They’re just a beautiful fish,” he says. He wants to mount a rescue mission, and move them to a larger body of water, but neither man is sure the fish will survive. Menindee, too, is becoming endangered. A town of just over 500 people, it is a pint-sized example of how resources and infrastructure can drive the fortunes of a town up and down. The Darling has always been an ephemeral river, but old timers insist that it is running dry for longer under the Murray-Darling Basin plan. Now a project lodged by the NSW government with the MDBA proposes shrinking the Menindee Lakes and draining them more often. It will almost certainly result in a dry river south of the lakes becoming the norm most years. And that will have unknown consequences for fish populations. Why would the NSW government want to do this? With a kind of Kafka-esque logic, the Menindee Lakes project is about delivering more environmental water to the Murray Darling river system, by reducing evaporation from the lakes. But it will leave the lower Darling drier more often, cutting off the Murray from the Darling and leading to unknown environmental consequences for fish, bird and land-based wildlife that depend on the river. Until now, most of the water retrieved under the Murray-Darling Basin plan for environmental flows has come from buying water rights back from irrigators. But with two-thirds of the target achieved so far, most of the easier deals have been done. So the federal government, under the former agriculture minister Barnaby Joyce, proposed that 605GL of the remaining 1300GL that needs to be found could come from projects that deliver “equivalent environmental outcomes”. NSW has put forward the Menindee Lakes project as its major contribution. It says it can save up to 106GL by cutting evaporation from the lakes system. But locals say the project amounts to “decommissioning the lower Darling”. “If you think this is bad,” says local grazier Rob McBride of Tolarno Station in reference to the fish kills, “just wait till the Menindee Lakes project goes ahead. “This is just a dress rehearsal to what will happen in the river,” he says. The impact of changed water practices under the Murray Darling Basin plan is obvious in Menindee. Hundreds of acres of dead grape vines stand like skeletons around the town. Menindee table grapes were once famous but with the dwindling river, Costa Group, a major agribusiness, made the decision in the 2000s to abandon production and consolidate in more reliable parts of the river system. Downstream, Webster Ltd’s Tandou, facing uncertain flows, sold its water rights to the government in 2017 for $80m and announced it would no longer grow cotton. The buyout meant there was even less reason to send water down the Darling. Then came the decision to build the Broken Hill pipeline. The deputy mayor of Wentworth shire, Tim Elstone, said the $500m project was rushed through without an environmental impact study, without a business case being made public, and with little consultation. His town, which sits at the confluence of the Murray and the Darling, is where the water will be taken from to service Broken Hill’s needs in the future. “We knew about it when we read about it in the local paper. There were informal talks with engineers, but there was never a formal business case put to council. We got a couple of emails saying we could look it up on a website but it was done and dusted by then,” he says. “Certainly we don’t begrudge Broken Hill a clean, good-quality water supply but it cannot be at the expense of the lake system,” he says. The pipeline means that there is no longer any reason to keep a mandated amount of water in the Menindee Lakes to provide water for the people of Broken Hill, as has occurred to date. But the Menindee Lakes project will go much further. It is proposing to reset the threshold for the lakes from 240GL to 80GL, which is just a fraction of the 1,730GL the lakes can hold. This, says McCrabb, will cripple the tourist industry of Menindee. Grey nomads don’t come when the lakes are dry. Sports fishing will also stop, he predicts. A report by consultants Deloitte contains six options to provide alternative water for towns that will be affected in the 900km stretch of river between Bourke and Wentworth. This will affect several hundred graziers and their families and the towns of Wilcannia, Menindee and Pooncarie. The bureaucratic language of the Deloitte report conceals the real impact of the project. “The proposed Menindee Lakes project (MLWSP) has been shown to impact water security and supply in the lower Darling,” it says. In other words, the river will run dry more often. It says that alternative infrastructure will be needed to replace the water supplies to homesteads and in the towns along the river. Option one talks about “structural adjustment” for the graziers along the river. This is code for buying out their water entitlements or their farms altogether. “A compensation package has been proposed to remove high-security entitlements from the region,” it said. Pooncarie’s town water would be met by another pipeline running up from the Murray “that would only operate intermittently during no-flow events”. Other options include building on-farm storages for the graziers along the river, tapping into artesian water using bores, or building additional weirs and storages along the river. Option six, which is preferred by the newly formed Menindee Water Users group, headed by local police seargent Paul Reynolds, involves compromising on the water savings from the Menindee Lakes plan and keeping more water in the lakes. “This option assumes a drought reserve of 275-615GL stored in the top two Menindee Lakes – Lake Wetherell and Lake Pamamaroo,” the Deloitte report reveals. But this will leave NSW with roughly half the water savings it has sought to deliver. As for the environmental impacts of the options, the Deloitte report makes only passing mention, saying more work needs to be done. The MDBA’s own assessment also raised serious concerns about the impact on fish nurseries in the Menindee Lakes, which help restock the entire river. But despite this, the MDBA waved the project through the first stage making it very difficult to reverse course. McCrabb says the “water savings” from curbing evaporation are also hotly contested. 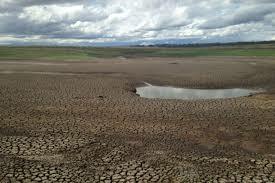 The NSW government has put water lost to evaporation from Menindee Lakes at 106GL a year. But McCrabb and others say the likely savings are much lower. This is because the inflows are calculated according to an old depth gauge and volumes extrapolated, and do not allow for silting in the lakes since the last serious study was nearly two decades ago. This, he says, means the inflow is likely overstated. Meanwhile outflows are more carefully measured when they pass through gauges on the channels and back into the river system. Evaporation is then calculated by the difference. A second calculation of evaporation uses a metal pan at the Department of Primary Industries’ Menindee office. It also likely overstates the evaporation rate as the lakes are deeper and colder than the metal tray, says McCrabb. A decision to move to a pipeline will change the lives of those south of Menindee, forever. They might achieve a more reliable water supply, but they will be living next to a dry river. For the Indigenous people along this stretch of the river, the Barka, the concept of a drier river, flowing less frequently, is devastating. Literally “the river people”, the Barka have been granted native title along the river and co-manage Kinchega National park. But they are watching their land die around them. It could also challenge the very existence of towns like Pooncarie, population 150, 130km south of Menindee on the lower Darling. A hundred years ago it was a river port but now survives as a tourist town and a fishing spot. “It certainly affects us in so far as fishing,” says the owner of the Port Pitstop, Val Kitson, as she watches the river dwindle. “We still have travellers go through, we still have locals and the school’s about to reopen so that’s a bonus for us,” she says. The fish kill was the last straw. “A little town like this that relies on tourism, fishing,” says Mouse, one of the locals at the pub. “It going to kill us,” he says of the Menindee plan. “It’s an utter shame, it’s wrong,” Kitson adds. Originally published in The Guardian, 23 January 2019.